Radiation resistance: Standard: 2×108 rads. Qualified life: Up to 60 years + LOCA. Valcor’s nuclear process solenoid valves are extremely reliable due to their rugged design, simplicity of operation, and a minimum number of moving parts. Available in a multitude of body sizes, materials, operating voltages, flow capacity, and pressure ratings, Valcor valves are designed and manufactured according to customer specifications and following the guidelines of ASME B&V codes. 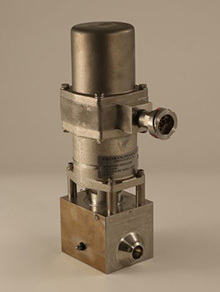 These valves are engineered for liquid or gas applications in the nuclear industry. Typical applications are feed water control systems, dump lines, make-up water, miscellaneous process systems, N2 systems, monitoring and sampling systems.